It is that time of year again, The Bachelor Pad, where tears are shed and drinks are downed. This show has no boundaries, the majority of the time you want to cover your eyes, which is the point. We have the typical introductions, except feuds are already forming. Did anyone notice Ed and Chris were on the same rooftop in Chicago? We learn there was truth to Ed's cheating, he wasn't prepared for a serious relationship, so why Blakeley and her blessings return, we hear she is really good friends with Jaclyn, which led up to Jaclyn's intro well. Jaclyn expects to lose friends, her shirt, "can't buy me love" adds the perfect touch to her introduction. We see Kalon driving some expensive car that may or may not have been rented, like his helicopter ABC probably paid for. He tells us he is going to ruin our summer, can't wait. Superfans: Paige: She has been my only favorite, SWAT: This dude has candles, flannel pajamas, shoots stuff and watches The Bachelor? I really hope the producers had a hand in his intro, if not his life is way over dramatic. Donna: Calls Holly an idiot, oh dear, there is things you don't say and that is one of them. Twins: Why in the world did ABC pick up The Situation's sloppy seconds. I am sure Wolfie appreciated being on their TV. Does anyone believe one of them is a virgin? The former contestants arrive: Chris is up first, he had a bit of healing time and is ready to jump into bed with anyone. Lindzi: Her new hair is amazing, seriously how pretty is she? Ed shows up and Justin is surprised by his outfit, in a good way, I think. He wasn't around during Jillian's season. Ed making a comeback, without the green shorts. Nick: This was very interesting, because he had talked about having a crush on Lindzi during Ben's season. I really liked his new hair color, brown suits him. Rachel: I was very excited to see her and her fabulous bangs. Sarah: I don't really remember her, but someone did. She was on Brad's 1st season Ryan: this guy is still a virgin, doesn't drink and this is probably why I don't remember him. Jaclyn: People either love or hate her, if you know me, of course I love her. There is nothing more comical than her thinking Ryan was a fan. She talks about her and Blakeley's tumultuous relationship, says Blakeley is like 82 and in other words Jaclyn is Bachelor Pad gold. Tony: He is back, this made me cringe, his crying episodes were too much for me. If he has a crying fit again, I might beat my head against the wall. Michael: Returns for love as the girls are melting. Erica Rose: This girl makes me laugh a lot with her spying and one-liners. 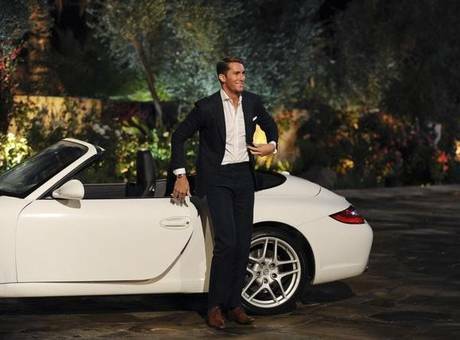 Kalon: He shows up in a Porsche, of course he does. I somehow missed Jamie's entrance, I'm sure it was "fancy." Fans arrive: Donna: Why does she have a clutch? This isn't a club. She loves her some Chris Harrison and Michael Stagliano. I'll admit her body is killer. SWAT: Wants a photo with Chris Harrison, I thought they weren't allowed electronics. Paige: She is such a cool girl, and the only fan I was a fan of. David: This guy just seems like he will be hated. Twins: They were made for this show, and just happen to be the Situation's "dumpster trash." I love the drunk version of Ed, he is hysterical. "It's not a hot tub, it's a cold tub." Jaclyn says, he will be dead if he gets her eliminated. I have a feeling they will be quite the dynamic duo. Challenge: The partners have to stay inside of hearts, that keep turning forward. Blakeley is excited to have "athletic" Chris as her partner, bless her heart, she must have missed the Scottish game episode. Chris only got the consolation mug. Erica and Nick were the first to fall, the worst part about that is Erica Rose is 29, not 30. It came down to Paige and Reid, and twin one with David. I was very sad to see Paige and Reid lose, "Reid the Paige." Fantasy Date: David and the twins get to go on a "fantasy date." They go in a limo to a amusement park, ride a ferris wheel and go skinny dipping, while they are comparing themselves to every season imaginable. I really don't know if I believe the twins are , or were put on here to make my recaps more entertaining. That twin really seems like a virgin, dropping her clothes and all. Back at the ranch: Chris goes for Jamie, man he is on a roll. He already had Blakeley, so much for his broken heart. Blakeley and Jaclyn rain on the Jamie parade and Chris looks scared to death. The next day: David is officially the stupidest person on earth. You do not tell Erica you are sending her home, ever. The girl has a law degree, and is brilliant, bad move. If anyone was offended by Erica talking about fans needs to chill out, she was just bringing David down a notch, she loves her fans including me. Cocktail Party: SWAT dude goes into save himself mode. I am distracted by Rachel and Jaclyn's amazing outfits. Reid goes is save Paige mode, and the veterans stick to their guns. This makes me really sad, because Reid is trying so hard for her and Paige is sweet. Chris is so drunk and I love he said he was "Pro-Erica." Somewhere along the line Kalon became Tony's bi***. I really wish I could have seen this for myself. I don't blame SWAT for going against David's plan, since he put the target on his back. Leave it to Kalon to lie to someone's face without even blinking. Roses: Lindzi Chris Sarah Ed Rachel Reid Jaclyn Michael Jamie Kalon Blakeley Ryan Donna Tony Nick Erica I am sad to see Paige go, but The Bachelor Pad's walls would have crashed down if it would have been Erica Rose. Two fans getting sent home proves David should not be in charge of anything. Hopefully Paige and Reid will find each other after. What did you all think of this episode?